Pictures: Yoana Kochneva, Assistant Designer. Jacksonville University and Remembering for the Future Community Holocaust Initiative presented “Complicity & Resistance in a Controlled Society” on Thursday, February 17 at 7 p.m. in Terry Concert Hall on campus. 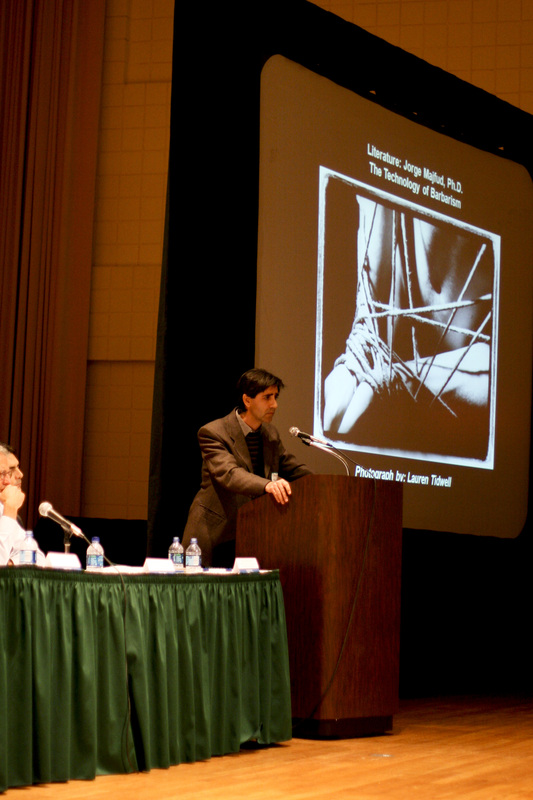 The event, which was moderated by Dr. Douglas Hazzard, dean of the College of Arts and Sciences, was part of the Future’s 2011 lecture series which engages experts and the public in a discussion of some of the most important questions we face today on medical ethics, eugenics, perceptions of disability and diversity. There was also a photographic works on display, which were created by JU photography program students Jesse Brantman, Elise Gates, Ross Howard, Taylor Middleton, Dustin Mollohan, Suvarna Shah and Lauren Tidwell, under the direction of Ginger Sheridan, assistant professor of photography. Each student interviewed a Complicity and Resistance program panelist, and then created a small series of Modernist, B&W photographs expressing the photographer’s internal response to their speaker’s theme using abstract expressionist vocabulary. Remembering for the Future Community Holocaust Initiative uses the lessons of the Holocaust to confront hatred and discrimination and build understanding and acceptance throughout our community. Working together since 2004, we are a collaborative partnership of Jacksonville’s leading education, humanitarian, non-profit and government organizations, businesses and community leaders.